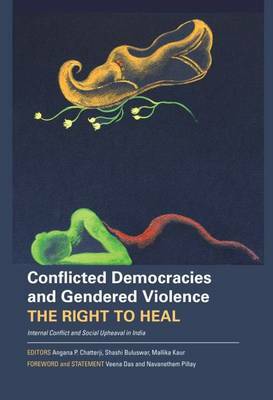 Conflicted Democracies and Gendered Violence elucidates the centrality of political and foundational violence in the governance of conflicted democracies in the postcolony, calling attention to the urgent need for transformation. Spectacular and quotidian gendered and sexualized violence by states and collectives holds in place fraught and unjust histories and relations between elites and subalterns, majoritarian subjects and non-dominant "Others." At the intersections of nationalist and decolonial confrontations, such violence regularizes states of emergency and exception. Through oral history, archival, and legal research undertaken over three years, this interdisciplinary work underscores the need for transitional and transformative justice mechanisms in conflicted democracies to address protracted conflict (focusing on their internal dimensions) and social upheaval. India serves as a case in point, exemplified by ongoing and recent conflicts in Jammu and Kashmir and the Punjab and episodic social upheavals in Gujarat (in 2002) and Odisha (in 2008). Victim-survivor narratives of counter-memory, historical records, and legal analyses of formative cases detail the depth and texture of social suffering and illustrate the inadequacy and inhumanity of official responses to events of extraordinary violence. Expanding on methods in justice and accountability and espousing the right to heal, scholars and practitioners raise critical questions regarding the state, civil society, and diverse institutions, and the most elemental of constituents: victim-survivors. Contributors: Angana P. Chatterji, Mallika Kaur, Roxanna Altholz, Paola Bacchetta, Rajvinder Singh Bains, Mihir Desai, Laurel E. Fletcher, Parvez Imroz, Jeremy J. Sarkin, and Pwi Wu.